Just a quick note here: Although we typically examine the market as a function of total return and with the inclusion of dividends, for this particular article we are looking only at changes in index prices. 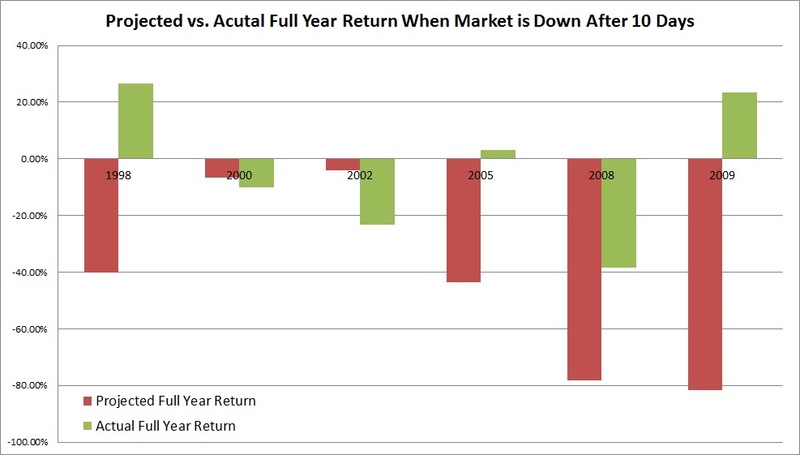 As such, S&P 500 returns will appear lower than your typical S&P 500 Total Return data. Once such example of this was last year. In 2015, the S&P 500 generated a Total Return of +1.38%.However, the index (excluding dividends) showed a full-year price change of -0.73%. Get it? Got it? Good. On Friday, the S&P 500 closed at 1,880.29 and in so doing completed the calendar year’s first ten trading days with a price depreciation of 7.75% from its 2016 starting point. I observed earlier in the day that the proper view of the stock market and its indices is as a barometer of investor sentiment. I stand by that assertion (trite as it may be,) but I still think it’s worth identifying trends in long term investor sentiment based on early-year results. 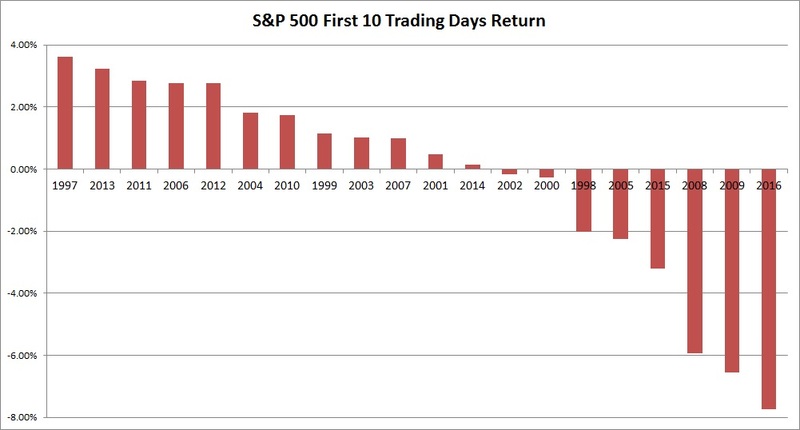 In search of answers, I analyzed 20 years of early market activity—in this case defined as the first 10 trading days of the S&P 500. In a lot more words and and some graphs: keep reading! There’s nothing conclusive to glean here. So, I’ll just pass along some good news and bad news on a number of fronts. In sticking with the theme of this year’s stock market, we’ll do bad news first. The bad news is that the S&P is down 7.75% year-to-date. If you like that you’re either heavy in cash, shorting the market or otherwise masochistic. How bad is that performance? Well, it’s the worst we’ve seen over this particular sample and per a number of sources the worst market start ever. The good news, however, is that we’re not completely out of line. Yes, this is the worst data in the sample I studied and the worst in the history of the market. 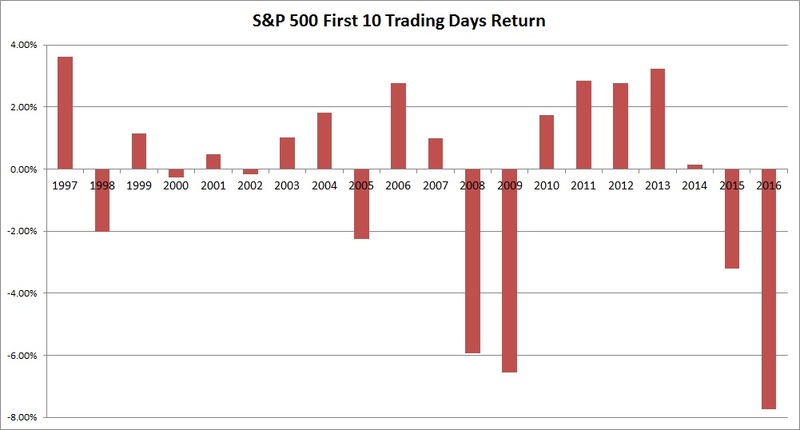 But we’re not drastically off the paces set most recently by the first 10 trading days of 2009. Along those lines, don’t forget that the S&P 500 index actually finished 2009 up 23.45% for the year. So the last time the market opened close to this ugly, the year turned out quite nicely. But the good news is there’s really not a pattern for down starts definitively indicating market tragedy. Beyond the fact that three of these “down starts” generated positive full year returns (in years 2009, 2005 and 1998), you have this tidbit: The total full-year return for the seven years that opened down was just -2.80%. If that average were to hold this year, then the damage would already be done. Are we predicting that? No. But it’s worth observing. The bad news is that if this market trend continues for the entirety of 2016, losses will be truly steep. 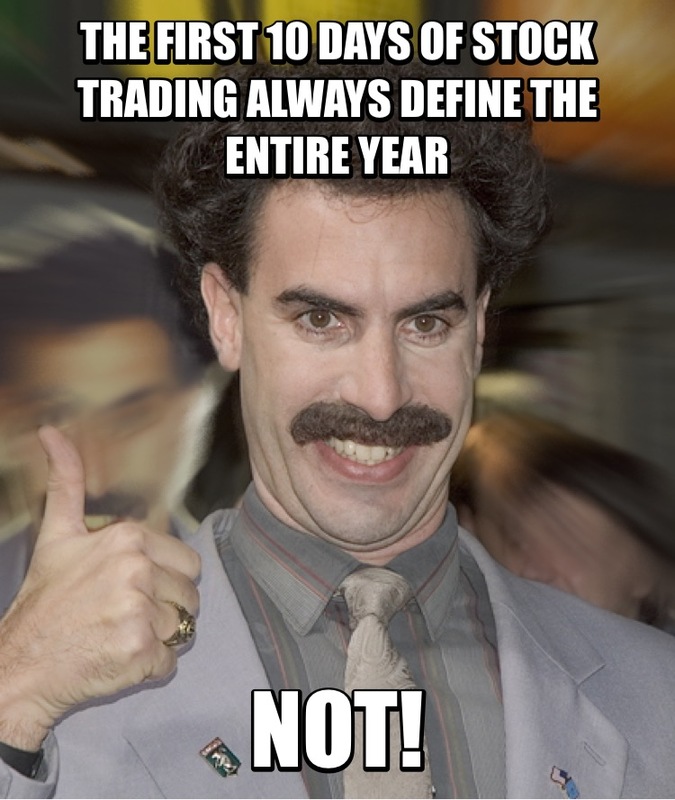 We’re just 10 trading days into the year and the market is open for roughly 250 trading days this year. If the next 24 10-day sessions yield identical results (a depreciation of 7.75% each period), then the S&P 500 will decline a total of 86.68% for the year. That’s not bad; it’s absolutely disastrous. The good news in this instance is that the stock market is not linear. The better news is that for better or worse extrapolating the first 10 days of the market’s performance and applying it linearly to 25 10-day periods is a terrible indicator of full-year performance. And there’s reason to believe that the market does an inordinate amount of movement over the year’s first ten years. What does this mean? In laymen’s terms, if (on average) up markets mirrored their first 10 trading days for an entire year, we’d see an average return (during up years) of +64.77%. 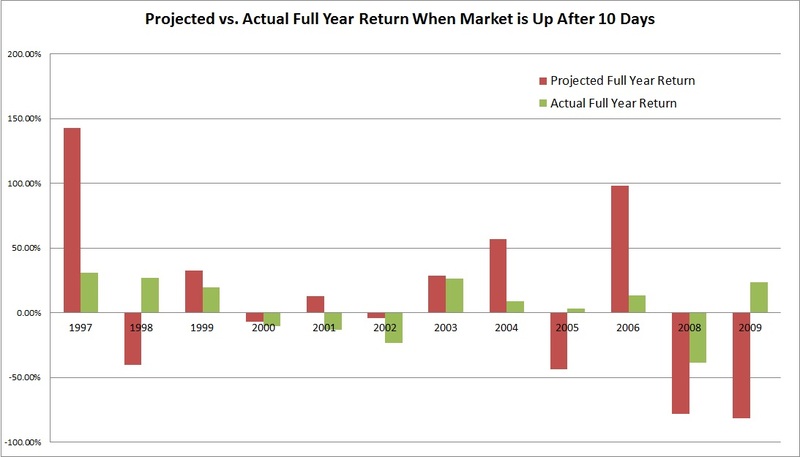 In reality, however, the average return for those years is +13.10%. In other words, there’s cause for optimism here. Perhaps, the next 10 days—or at least the next 24 10-day periods—will be better. There’s certainly not a reason to think they’ll be worse or even just this bad. In conclusion, we don’t really know anything. There’s not a pattern here. And coming off of a historically bad 10-day opening for the market, that’s actually a good thing.